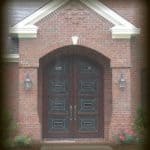 This pair of 36″ X 96″ Mahogany “H” doors makes for an interesting Contemporary look on this modern home. The doors have been finished with a dark walnut stain. The Insulated Leaded Glass was designed and built in our glass studio using a variety of beveled and clear textured glass. The hardware is Baldwin.